If you love spooky fun supernatural TV shows like Ghosted as much as I do, you definitely need to add these 10 shows to your to-watch list! Check them out and tell me your favorites! I’ve always been a huge fan of shows that mix the supernatural with a bit of comedy. While most of my favorites are heavier on the spooky and lighter on the laughs, Ghosted takes the opposite approach- more laughs than horror. Think along the lines of Ghostbusters. It’s a supernatural comedy television series that airs on FOX, making its premiere on October 1, 2017. 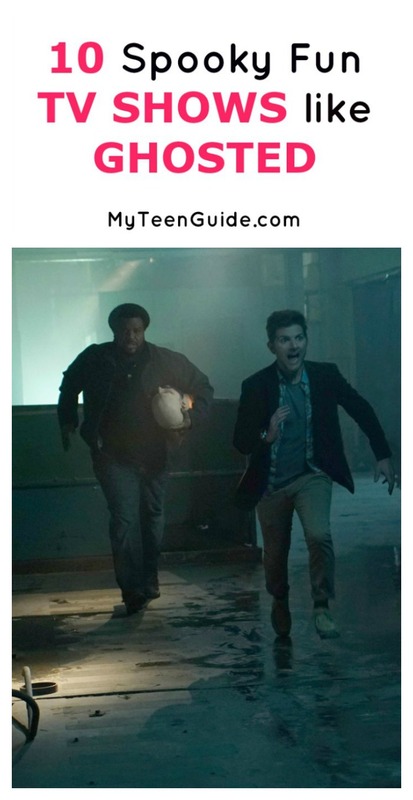 The series showcases Leroy Wright (Craig Robinson), a paranormal skeptic and Max Jennifer (Adam Scott), a paranormal believer, who team together to investigate paranormal occurrences around Los Angeles, California. Here are some other awesome TV shows like Ghosted. Being Human is a supernatural, comedy, horror television series that aired on SYFY for 4 seasons, from 2011 to 2014. It is a remake of the British television series, of the same name, which aired for 5 seasons, from 2008 to 2013. The series showcases the odd relationship between Sally, a ghost and Josh, a werewolf, and vampire Aiden. The three roommates move into the same house (well, Aiden and Josh moved in, Sally was already haunting the place!) and try to live normal lives despite being anything but normal. Bitten is a fantasy, horror television series that aired on SYFY for 3 seasons, from 2014 to 2016. It is based on the first book- Bitten- in the 13-book series- Women of the Otherworld- by Kelly Armstrong. The series focuses on Elena, a werewolf who is trying to balance her life with her human boyfriend and being a werewolf. Oh, did we mention that Elena is the ONLY surviving female werewolf? That’s bound to cause some issues! Genie in the House is a British comedy, fantasy television series that aired for 4 seasons, from 2006 to 2010. The series tells the story of a widowed father, Philip and his two teenage daughters, Emma and Sophie. The girls discover Adil, a genie, after finding a golden lamp. Their father bans magic in the house, but the girls find clever ways to use Adil’s powers to get what they want anyway. If you’re looking for shows like Ghosted that are a bit heavier on the spooky side, Ghost Wars is the one to watch. This paranormal, action television series has aired on SYFY, for 1 season so far, premiering on October 5, 2017. The series centers on Roman, an outcast in a remote Alaskan town, who must save the town residents from paranormal forces. The problem? The townspeople aren’t too kind to paranormal people! If your town was overrun by demons, I bet you’d feel the same way, though. Grimm is one of my all-time favorite shows like Ghosted. It’s a fantasy, mystery, supernatural television series that aired on NBC for 6 seasons, from 2011 to 2017. The series showcases Nick, a homicide investigator, who discovers that he’s a Grimm, a guardian-like man with the ability to spot Wesen (aka monsters and other paranormal creatures). While most of his ancestors simply beheaded the Wesen they came across, Nick does things a bit different. In fact, his best friends are a blutbad (kind of like a werewolf) and a Fuchsbau (a fox-like creature). Misfits is a British action, comedy, supernatural television series that aired for 5 seasons, from 2009 to 2013. The series tells the story of a strange electrical storm, that provides five community service juveniles- Alisha, Curtis, Kelly, Nathan and Simon- with supernatural powers. Penny Dreadful is a fantasy, horror, thriller television series that aired on Showtime for 3 seasons, from 2014 to 2016. It draws on the characters from the novels- Dracula (1897) by Bram Stoker, Frankenstein (1818) by Mary Shelley, Strange Case of Dr. Jekyll and Mr. Hyde (1886) by Robert Louis Stevenson and The Picture of Dorian Gray (1890) by Oscar Wilde. Powerless is a comedy, fantasy television series that aired on NBC for 1 season in 2017. The series takes place in the DC Universe and focuses on Emily, the research and development director of Wayne Security, and her staff, who make products designed for defenseless humans, so they may feel safe in a world of superheroes and supervillains. The Returned is a supernatural, drama television series that aired on A&E for 1 season in 2015. It was adapted from the French television series, Les Revenants, which has aired for 2 seasons so far, premiering on October 31, 2015. The series tells the story of several townspeople, who were presumed dead but have come back to life. Warehouse 13 is another one of my top 3 favorite shows like Ghosted. It’s a fantasy, mystery, sci-fi television series that aired on SYFY for 5 seasons, from 2009 to 2014. The series centers around Myka and Pete, Secret Service Agents, who are assigned to a covert area that contains supernatural artifacts. If the comedy factor is what you’re really looking for in shows like Ghosted, I recommend Warehouse 13. If you want a good balance between comedy and supernatural, Grimm is at the top of my list! What are your favorite shows like Ghosted? Share in the comments!